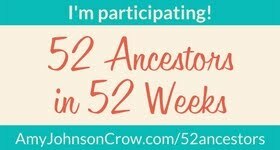 Review each ancestor on the day before their birthday as shown on the calendar on my website. My birthday calendar showed two ancestors for January 8th. So I posted one yesterday on the 8th. The other one was Elizabeth Charles. But while reviewing her information I came up with a question about her. The birthday calendar links to the wife of Samuel Nicholson, my 8th great-grandfather. She is shown as Elizabeth Charles born 8 Jan 1670. There was an Elizabeth Charles born on the 8th of January in 167_, daughter of Will. Charles and his wife Abigail, according to birth records recorded at Perquimans Precinct, Old Albemarle County, North Carolina. It appears the births of 7 of their children were all recorded at the same time, probably on Dec. 5, 1679. By comparing the birth years for her siblings, I believe that Elizabeth's birth year was probably 1671/72. William Charles, oldest son of William and Abigail, married Elizabeth Kent on 8 Nov 1683. Samuel Nicholson and Elizabeth Charles were married at a Quaker meeting 16 Dec 1688. So by 1684 we have at least two women named Elizabeth Charles: the daughter of William and Abigail and the wife of William Charles (2). Why does this make a difference? Because William (2) died sometime between 4 Apr 1687 when he made his will and 23 Sep 1687 when the will was probated, so now there is a widow named Elizabeth Charles who probably married either Jeles Longe or Samuel Nicholson. Now which is most probable? We do not know the exact date for William (2)'s death, but since Jeles Longe's marriage was before the probate date, it seems more likely to me that he married the daughter Elizabeth and Samuel married the widow. Another clue to support this is in the abstracts of Quaker Marriage Certificates including Perquimans Monthly Meeting compiled by Gwen Boyer Bjorkman. The index shows only two entries for the name Kent: Hannah and Mary. They were witnesses at the marriage of Samuel and Elizabeth, which would be reasonable since she would be their sister. This conclusion does not agree with all of the family trees posted out there that I have seen, so I would appreciate any comments others can share. Write something for my blog each day. Have it be about the ancestor on his or her birthday. So if Elizabeth Charles born on January 8th is not my ancestor, Elizabeth Kent is. She was shown in the birth records as born on 1 June 1667 to parents Thomas and Ann Kent. So I plan to wait until June 1st to write about her. Enter some missing information or make corrections about the birthday ancestor in my database. Now back to my database and make some changes about this 8th great-grandmother. Did Any of Your Family Attend Oak Plain School? Am I Related to Buster Keaton?